I had two lovely weeks in Sweden earlier this summer. I visited several libraries while I was there, and had a number of library-related discussions. 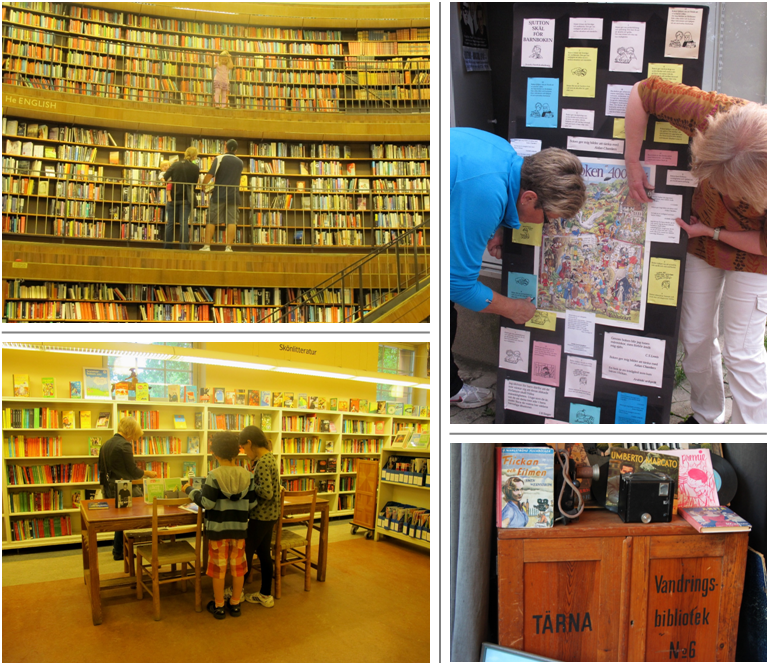 The children’s libraries I saw were amazing: lively and bright, and incredibly well-stocked. It was fascinating to see lots of children’s books in English and other languages, even in a library in a small town. Stockholm Central Library is gorgeous. I loved watching children in the huge circular room at its core. They were mesmerised. In the main square of Hudiksvall on the Baltic coast there was a showcase outside the library full of inspiring quotes about children’s reading. At the centre was a wonderful poster celebrating 400 years of children’s literature. I had no sooner commented on it than the librarian found out, rushed into the square, dismantled her display then and there, and handed me the poster. What an honour! It’s fabulous, full of pictures of characters from famous children’s books from around the world. I was at a gathering with lots of children and adults that evening. We spent ages trying to identify them all. 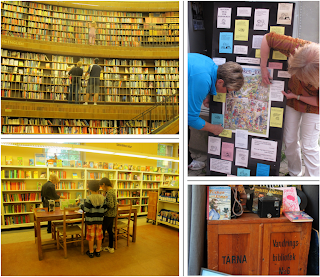 School libraries have recently become statutory in Sweden, as I wish they were in the UK. I spoke to the teacher leading on a new reading project in the Hudiksvall area. She told me that in fact many schools do not have libraries yet, or if they do they are small and undeveloped. She very much wants to improve the situation, as well as fostering partnership working between public libraries and schools, something quite new there. How I’d love to be involved! Without doubt the tiniest library I came across was contained in the cupboard you can see here. It’s an early travelling library, which used to be transported from school to school.